The femur, or thigh bone, is the most proximal (closest to the body) bone of the leg in vertebrates capable of walking or jumping, such as most land mammals, birds, many reptiles such as lizards, and amphibians such as frogs. In vertebrates with four legs such as dogs and horses, the femur is found only in the rear legs. 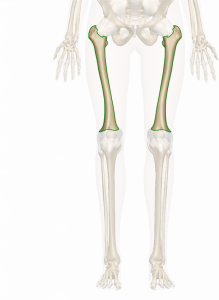 The femur is the largest bone in the body. The head of the femur articulates with the acetabulum.